It was the middle of the night in November 2013, just after Typhoon Haiyan struck, when Sako Narita ’04, interdisciplinary studies (international emergency health services), received an urgent phone call from Japan with a request: a disaster response team organized by Humanitarian Medical Assistance (HuMA) to help provide aid to the Philippines needed her expertise. The call did not come as a surprise to Narita, who is currently a master’s student in UMBC’s emergency health services (EHS) department. She had prior experience providing disaster response for the 2011 earthquake and tsunami in her native Japan and a previous typhoon in the Philippines in 2012. 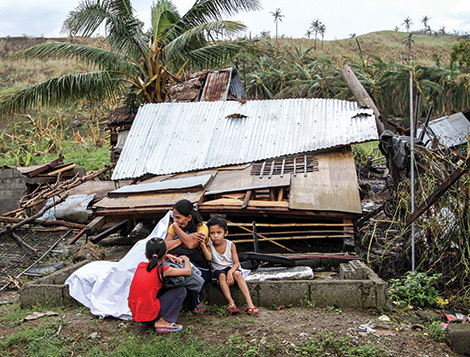 Narita spent ten days in the Philippines after Haiyan struck. She provided needs assessment, assisted patients, negotiated with local and international health and government organizations, set up mobile medical clinics, and did whatever she could to ensure typhoon victims received necessary care. One key part of Narita’s job was negotiation – a skill she has developed both in field experience and as part of her UMBC education. The on-the-ground situation during Narita’s first mission in the Philippines in 2012 required her to negotiate with local officials to gain access to the disaster site for HuMA. During her more recent trip, she brokered a partnership with an Israeli disaster response team. The international reputation of UMBC’s EHS department as a leader in the field helped attract Narita – a student from Japan who was interested in studying the intersection between medicine and emergency health services. “All of my knowledge about disaster response I got at UMBC,” Narita observes. “What makes our program different from every other program is that our focus is on that area of overlap between public health and emergency management,” explains Rick Bissell, a professor of emergency health services and the director of the EHS graduate program. UMBC’s graduate program offers advanced training in emergency clinical response, management and public health that prepares students like Narita to meet disaster-related emergency health needs (as well as less urgent needs) in both domestic and international situations. This priority on educating students as “whole people” is evident in the work of EHS alumni and students like Narita, who is also a national registered paramedic and Maryland emergency medical technician-paramedic. The level of dedication and quality of work for which the program’s graduates are known makes them much sought after in the aftermath of disasters such as Haiyan. Read the full issue of the Summer 2014 UMBC Magazine.